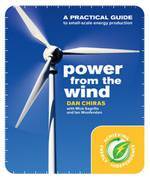 Power From the Wind: Achieving Energy Independence By Dan Chiras is another in a flurry of books on small wind in English. It joins recent books Wind Power for Dummies and Homebrew Wind Power that hit the trade paperback market in the past few years. Subtitled "A practical guide to small-scale energy production," the book follows ground well trod before and seeks to capitalize on the odd American desire to run their kilowatt-hour meter backwards. But there's much to like in Power From the Wind. Chiras is a professional writer and he's had the wisdom to consult two of the small wind turbine industry's gurus: Mick Sagrillo and Ian Woofenden. I obviously agree with his decision, I often quote them myself. Both are fonts of homespun straight-talk. I quote Sagrillo and Woofenden because I agree with their advice and they say it so much better than we writers, Chiras or myself. Thus, it's hard for me to find fault with Power From the Wind, since I agree with many of the tips and advice proffered. Power From the Wind includes lots of photographs and illustrations, unfortunately all are in black & white. (These days, color is almost a must.) Figure 2.12 on blade length and swept area is particularly good. So good in fact that I'd like to use it in my next book. Chiras has effectively used side bars to drive home important points. One, "Can Wind Do It All", is answered directly by Woofenden. The question "is a bit of a red herring. Wind is one piece of the puzzle; nothing is the whole answer." Point well taken. Another one of my favorite side bars is "The Dubious Promises of Vertical Axis Wind Turbines." The long discourse-it stretches across three pages-examines the so-called advantages of VAWTs and dismantles them one by one. In this thankless task alone, Chiras' book provides a real service. It's also heartening to see the authors say in one side bar "we strongly recommend focusing more on the swept area of a wind turbine than on its rated power." The four of us have been railing against the rated power nomenclature as long as we've been in the trade. Most readers will never realize the number of schlock books that have been published over the decades that have discussed only rated power at rated wind speed as the be all end all of understanding wind technology. As in Woofenden's Wind Power for Dummies, the book only uses the Imperial or English system of measurement-a system the English don't use themselves. New Society, the Canadian publisher, clearly is not interested in their home market and is targeting the much bigger and much richer US market. Another gem in Power From the Wind is a side bar on Sagrillo's technique for quickly estimating the height of obstructions. It's a good approach and one I've recommended ever since Sagrillo taught it to me a number of years ago. This side bar is then followed by a classic Sagrillo photo of a wind turbine surrounded by trees. As Sagrillo likes to say, wind turbines don't grow, trees do. The message: you need a tall tower to stay above the trees. Chiras and his co-authors are to be applauded for including a sequence of photos showing how to use a fall-arrest system. No book on small wind is complete-or responsible-without a thorough discussion of safety and the need for a fall-arrest system. My only real complaint about the book is the cover. The cover was obviously picked by the publisher without a lot of input from the authors. The picture is of an Enercon, a large wind turbine. These turbines are not in the book nor are the subject of the book. It's a great wind turbine and the book would have been better if the book had included it and others like it. For the modest cost of the book Power From the Wind is a good buy. Power From the Wind: Achieving Energy Independence By Dan Chiras with Mick Sagrillo and Ian Woofenden, New Society Publishers, 2009, paper, 288 pages, 7.5 in x 9 in, 560 g, ISBN: 9780865716209, $CAD 24.95, $USD 24.95.